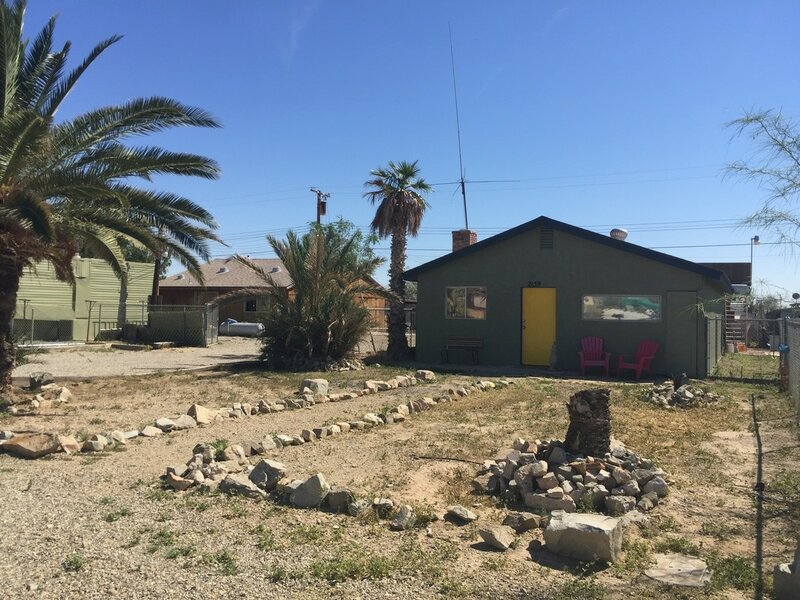 Bombay Beach is a tiny desert town—just under one-mile-square—that sits on the east shore of the Salton Sea in California's Imperial Valley about 60 miles southeast of Palm Springs in the midst of the Sonoran Desert. 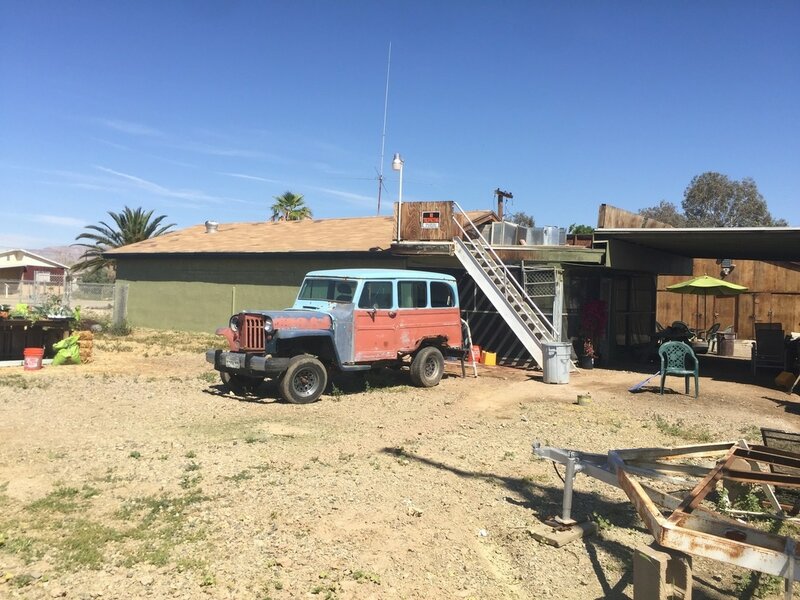 At 233 feet below sea level, Bombay Beach is geographically the lowest community in North America with a history of harder than hard knocks that can make it feel even lower. Words such as "bleak," "ruins," and "post-Apocalyptic" are used often to describe Bombay Beach, where only about a third of the town's 485 or so buildings are occupied and many of the other two-thirds stand open to the elements, skeletons of their former selves. 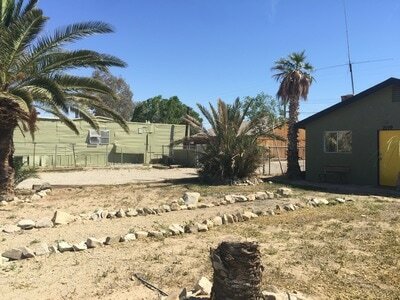 The whole community is a shadow of what it once was when, in its heyday in the 1960s, it was billed as the "Miracle in the Desert" and "Palm-Springs-by-the-Sea," with vacation homes, resorts, and restaurants that drew vacationing families as well as the rich and famous (Sinatra and The Beach Boys among them) to its shores, for waterskiing, and sport fishing for corvina and tilapia in the sea (which is actually a lake formed by accident when the Colorado River flooded the Salton Sink in 1950). ​All went sideways and by the 1970s, as the sea became so salinated (some say it's saltier than the Dead Sea) and oxygen levels plummeted, the corvina died out, and massive fish kills covered the shores with dead tilapia and thick salt deposits. In 1983, a flood decimated many of the homes and businesses along the waterfront. Over the years many residents who were unable to sell their homes just walked away, leaving behind their homes and possessions to the ravages of the harsh desert conditions, scavengers, and wildlife. The result is a veneer of desperation—part Mad Max, part ghost town—that belies the life and love, hopes and aspirations of those who remain. 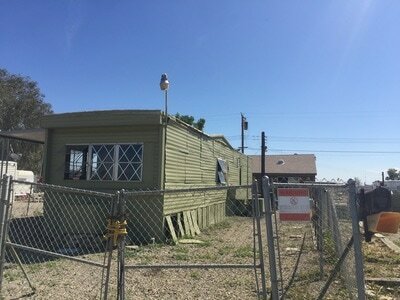 In 2010 (the last census data available), the Bombay Beach population was just 295 (having shrunk by 20 percent between 2000 and 2010), and is slightly smaller today. The average income in Bombay hovers right at the U.S. poverty line with about $11,000 per capita annually and $16,000 for a "household" (i.e. a family of two), falling vastly behind the median per capita income of about $51,000 nationally and $6o,ooo in the state of California. In late April 2016, flying deliberately under the radar on a weekend coinciding with the hyper-commercialized Coachella festival 40 miles away, a group of artists and patrons of the arts convened the Bombay Beach Biennale: Year 0—a three-day "happening" and art installation that encompassed the entirety of Bombay Beach and its residents. "Through an infusion of art, music, and philosophy, we are transforming this derelict yet inspiring place into a living, breathing art movement. 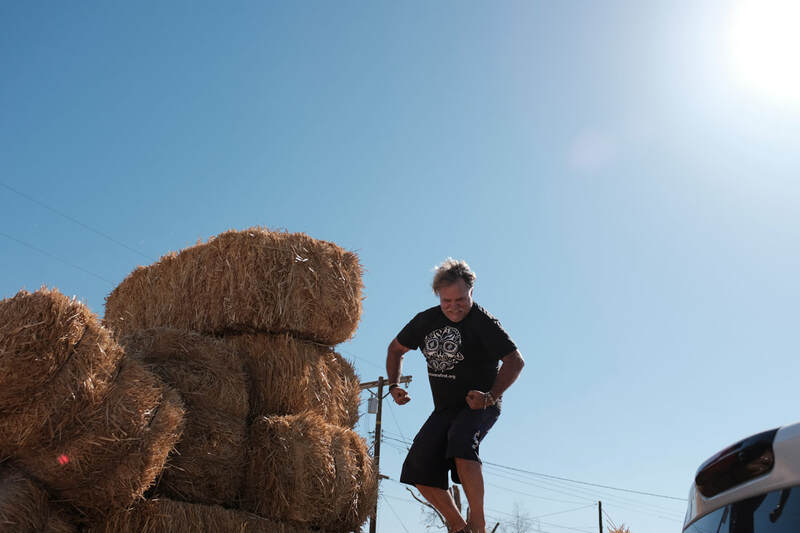 By leaving behind many of the installations and art pieces that have been created for the event, we hope to change the landscape of the town in a lasting and positive way." Abandoned houses and vacant lots served as canvasses for the artists who arrived from all over the world. Films were screened, musical concerts performed, and philosophical lectures delivered in people's homes, among the ruins on the Salton seafront, at the Ski Inn tavern and the American Legion hall. ​"The Bombay Beach Biennale is born out of a desire to bring attention to this marvelous and strange place, while preserving its unique spirit and personality." Nearly 40 percent of the population of Bombay Beach is 65 or older, with residents aged 50 to 64 making up 27 percent of the population, and children (under the age of 18) comprising 10 percent. Unemployment is rampant and social services are scarce. Bombay Beach is located in the Imperial Valley—a rich agricultural area that is the source of 20 percent of America's dairy supply—but if Miss Aqua's tiny convenience store is closed or runs out of milk, it's an 80-mile round trip to the nearest grocery store. The closest gas station is 20 miles away, the nearest hospital 37 miles away, and the town's children (there are a few dozen of school age) must ride the bus two hours each way to get to school every day. There's neither a public library nor public wifi anywhere in town, not even at the American Legion hall and the Ski Inn tavern that serve as the community's gathering places. Temperatures climb past 120 degrees in the summer and, because it sits on the southern edge of the San Andreas fault line, earthquakes sometimes arrive in swarms. Some residents, either through desperation or opportunism, make a habit of Nightwalking; seeing what can be easily stolen in the midst of the night to feed habits or greed. Bombay Beach is a hard place to live, seemingly perched on the edge of nowhere, a community that could be the poster child for "forgotten America." But it is more than that. Amidst the wreckage and the ruin, there is beauty and there is hope if we have the eyes to see it and the hearts to nurture it. 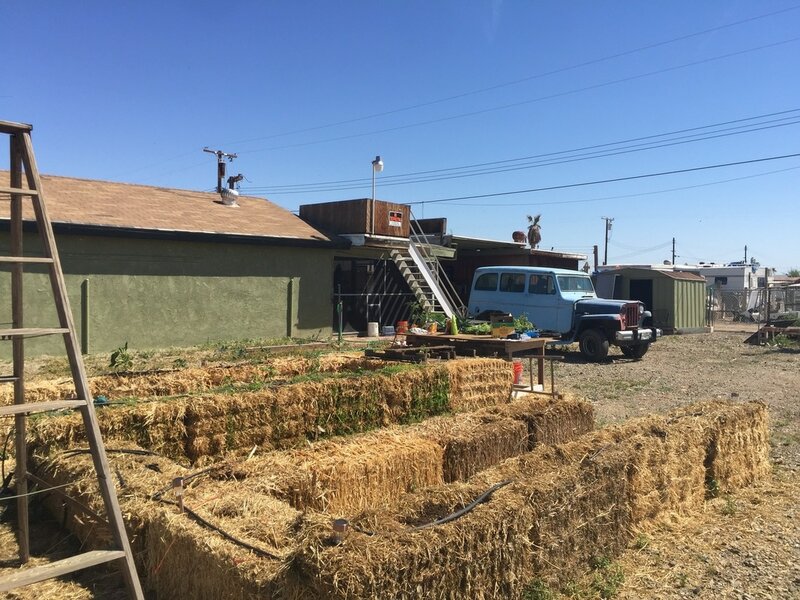 "Bombay Beach is truly a beautiful community that needs a little love and light to shine through," Day says. 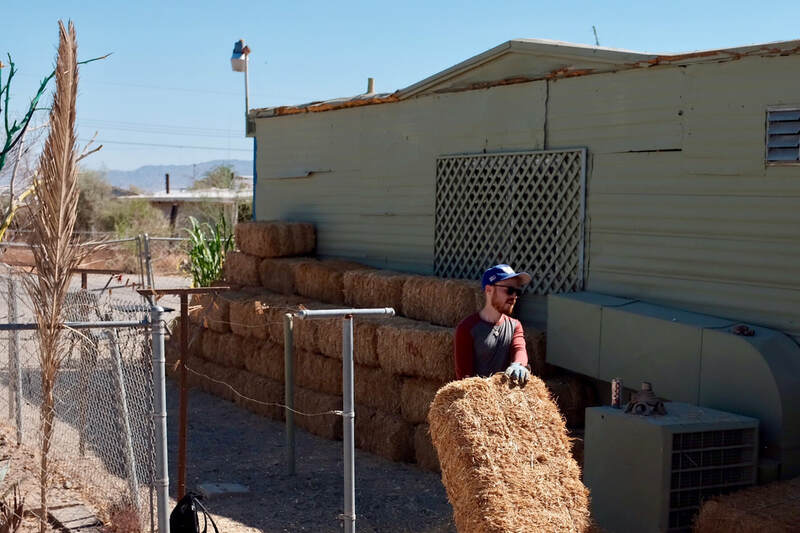 "It dawned on me how similar the needs are in Bombay Beach to the community development and sustainability needs in the communities we've served in the developing world for 18 years. It may be hard to believe that such essential needs aren't being met here in America, but in Bombay Beach—in Southern California right next to some of the most affluent communities on the planet—people are living on less than $11,000 a year, some have no electricity or running water, and basic nutrition, health care, and education are a struggle for many of our neighbors." Growers First was gifted four lots at the corner of Avenue D between 2nd and 3rd Streets in Bombay Beach where BBAC will be housed in several buildings that have been renovated this winter by teams of volunteers and many hours of hands-on work by Dave Day and our newest BBAC community coordinator and artist, Jack Parker, who has relocated from Laguna Beach to Bombay Beach with his love Stefani. BBAC includes a multi-purpose community center that will be air-conditioned and serve as a community cooling center in the scorching summer months, as well as a home for a wide variety of programming including 12-step recovery and other meetings, HIV/AIDS education, and a resource library with computers and free WiFi—a particularly significant service for the community where most residents have no digital connectivity at all. BBAC will also be home to the Black Crow Coffee Bar, a free coffee bar serving coffee from Growers First farmers in Mexico and Honduras, and an alcohol-free alternative gathering place, which we hope will be helpful to our residents struggling with addiction or families with children who would like to get out and mingle with their neighbors but don't want to bring their kids to a bar. The computer center will enable residents to take continuing education courses online, access a host of online state and local government services, connect to friends and family via social media, etc. 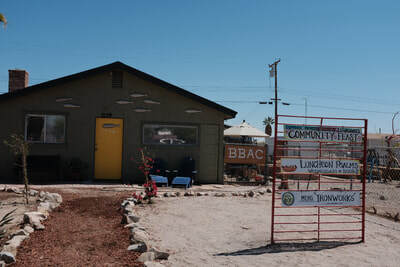 The Lodge also will be a gallery space to display the work of the many visual artists who live and work in Bombay Beach. Adjacent to The Kintsugi Lodge is The Barn, which will house work stations and supplies for artists and art projects, and will include at least one kiln. The Barn will have a swamp cooler in the summer months and, like The Lodge, be a cooling station for residents who don't have air conditioning at home (if they even have a home with electricity), and will be a venue for Artists-in-Residence to offer workshops. Next to The Barn is a guest house and a bunk house for visiting artists, volunteer and missions teams, and other visitors. 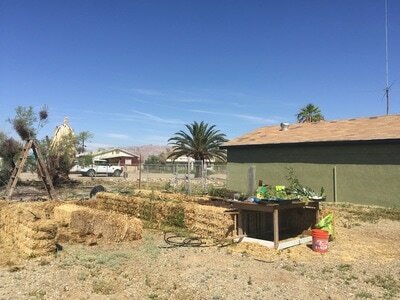 ​BBAC is also home to a community garden where heirloom seeds will be cultivated in much the same way they are at Growers First projects in Mexico and Honduras. There are plans to install geothermally-cooled greenhouses and to teach moisture-minded gardening, which is crucial in a drought-ridden desert setting. 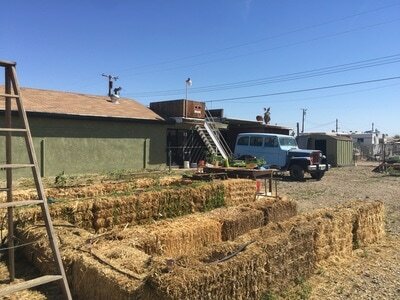 ​It is through small actions; growing your own food, nurturing community, educating people, hosting artistic and faith-based retreats, and fostering local and visiting artists, that we will create a wellspring of community spirit and interest in Bombay Beach. 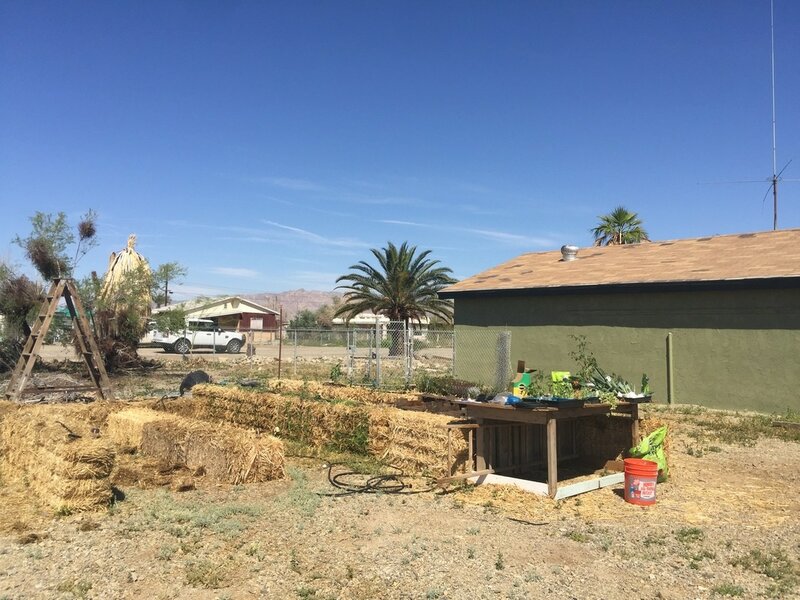 BBAC is also home to a community garden where heirloom seeds will be cultivated in much the same way they are at Growers First projects in Mexico and Honduras. BBAC also plans to include a bicycle program for the town, where so many people have no automobile or other means of transportation. The plan is to have 50 bicycles available to be borrowed from four or five stations around town. It is also a means to minimize our carbon footprint by encouraging the many visitors who come through town to take pictures or make movies to park their vehicles and get around town (and get to know the town better) on two wheels instead of four. And last but certainly not least, in cooperation with our friends at the Orange County Rescue Mission, BBAC will operate a food pantry on the campus for our neighbors Bombay Beach, which sits in a literal food desert at least twenty miles away from the nearest proper grocery store. 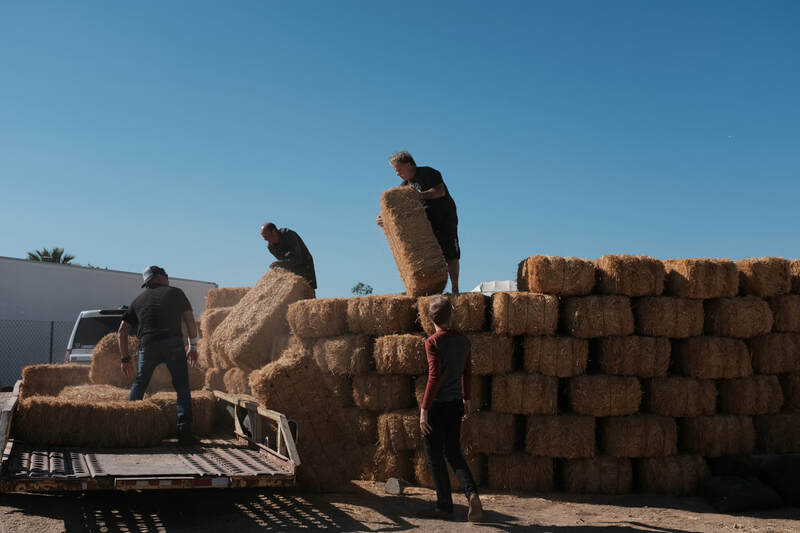 A vast majority of America's Winter Crops come from the Imperial County and as you drive along highway 111, you see the sheer disparity of food growing compared to the lack that exists within this tiny town.